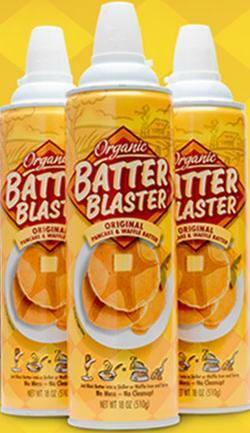 The Batter Blaster is awesome. It's organic too!! I just stare at their homepage and my brain shuts down. I just can't fathom the sheer genius necessary to come up with such a ridiculous product. Visit them here, and watch their retro style commercial! And when it's empty you can do whippets off of the gas! Fun for parents and kids! Yay! for wholesome family fun! That's just...not a good idea. Yet, I would probably give it a whirl. Hey, it's organic! That means it's better for you, right? Yeah, it's easier than a mix, which isn't saying much. Presuming it's comparably healthy and tastes good, why not? Of course, it's still silly even if it's useful. If I liked pancakes, I'd buy it. Since I don't like pancakes, it's silly. Don't worry, you can use it for waffles!